Why Disney World? | Walt Disney World, often dubbed the “Happiest Place on Earth,” is known for its family-friendly vacations and a lifetime of memories. 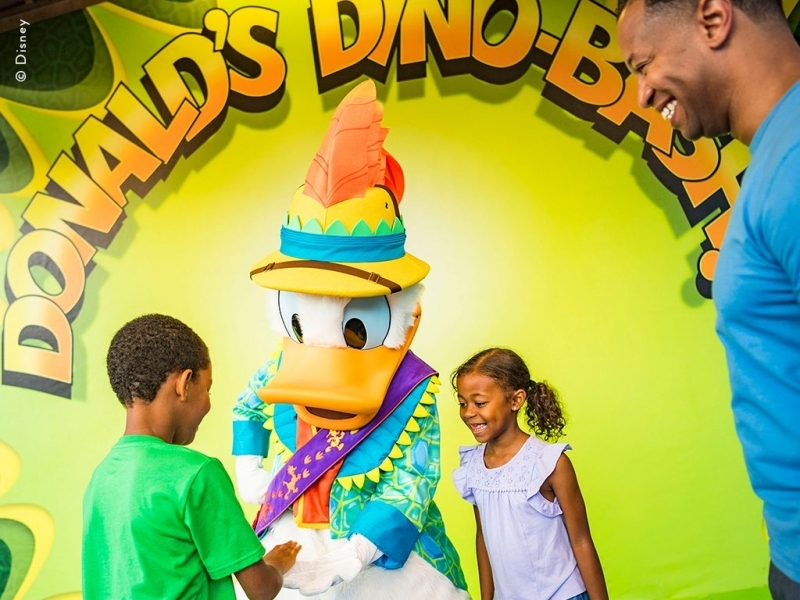 However, many families often shy away from planning a trip to Disney World due to the cost. Fear no more! Planning a trip to Disney World is easy, and it can be affordable, especially if you get a jumpstart. There’s a hotel room for every budget, so if you’re looking to splurge or save, you can. For some Disney magic at your hotel, try Disney’s All-Star Resorts, Disney’s Pop Century Resort, or Disney’s Art of Animation Resort. If you’re looking to spend, try Disney’s Caribbean Beach Resort, Disney’s Port Orleans Resort, or Disney’s Coronado Springs Resort. And, if you are looking to splurge even more, options include Disney’s Animal Kingdom Lodge or Disney’s Grand Floridian Resort & Spa. All resorts on Disney property offer transportation to and from the parks, whether you prefer bus, boat, monorail, or the new skyliner. Enjoy a fun-filled feast with Mickey and his crew at this character dining experience. Whether you prefer breakfast, brunch, or dinner, this buffet-style meal will have something for everyone. Quick tip: Add the Disney Dining Plan to your reservations to have your meals taken care of before you even arrive to your hotel. If you have little princesses in your bunch and need to find all of the Disney princesses before your trip is done, meet them all during this character meal, located inside a medieval castle. Ariel, Princess Aurora, Cinderella, Snow White, and Belle are all ready to meet you at this breakfast, lunch, and dinner buffet. Surround your family with the sights and sounds of the prehistoric world with this dining experience. With their “Dino-mite Dishes” and great family fun environment, T-REX offers an exciting experience where squawking pterosaurs, wooly mammoths, and a 15-foot-tall T. Rex comes to life every 20 minutes while you dine. Quick tips: We recommend getting the Park Hopper for you and your family. The Hopper allows you to go to and from every park, every day, as many times as you please. Also, if you are a Disney resort guest, you can experience Extra Magic Hours, which allows you and your family to enjoy the park an hour before the park opens or up to two hours after it closes. Magic Kingdom is most likely number one on your list, but remember that it’s probably number one on everyone’s list, so there will be long lines. Magic Kingdom has a ton of rides, especially for the little ones. The best route to take when it comes to beating the lines is to start at the back of the park and work your way to the front. Peter Pan’s Flight, Haunted Mansion, Pirates of the Caribbean, Space Mountain, Splash Mountain, and Seven Dwarfs Mine Train are all major favorites. 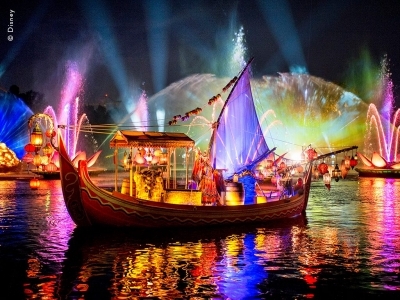 Explore the world through Epcot, quite literally. For some refreshing fun, check out Club Cool, where you can taste soft drinks from around the world for free. Also, you won’t want to miss Test Track, Soarin’, and Frozen Ever After before you visit each country. Toy Story Land is now open in Disney’s Hollywood Studios, and it’s a can’t miss. 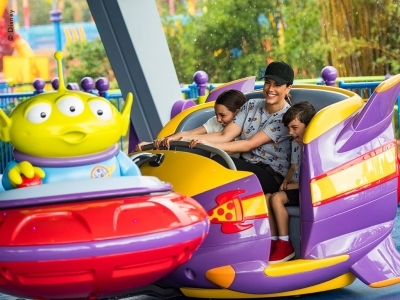 Take a spin on the Alien Swirling Saucers or get your adrenaline pumping with Slinky Dog Dash. If you’re a Star Wars family, you’re going to want to visit this fall for the opening of Star Wars: Galaxy’s Edge, where you have a chance to be in the driver’s seat of the Millenium Falcon in Millenium Falcon: Smugglers Run. Mickey & Minnie’s Runaway Railway will also debut this year. It’s the first Mickey-themed ride that puts you inside a Mickey cartoon. 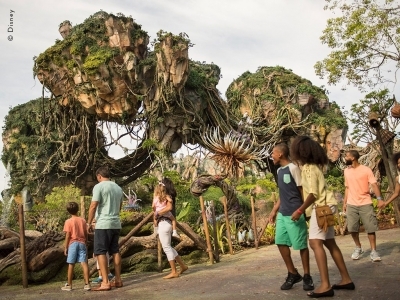 Go on safari at Disney’s Animal Kingdom. If you plan on riding Kali River Rapids, be sure to wear a poncho or bring a change of clothes because you will get soaked. 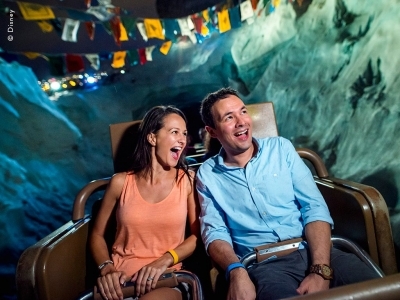 Also, don’t miss Expedition Everest (the little ones might want to sit this one out), Kilimanjaro Safaris, Na’Vi River Journey, and Avatar Flight of Passage. And get ready to bust a movie during the new Hakuna Matata Time Dance Party with Timon and Rafiki. Walt Disney World offers two incredible water parks: Disney’s Typhoon Lagoon Water Park and Disney’s Blizzard Beach Water Park. Both parks feature water slides that will entertain the entire crew. After, hop aboard the bus and visit Disney Springs for shopping and entertainment.